PHOTO BY LARISSA COE RHS President Patrick Malgieri. 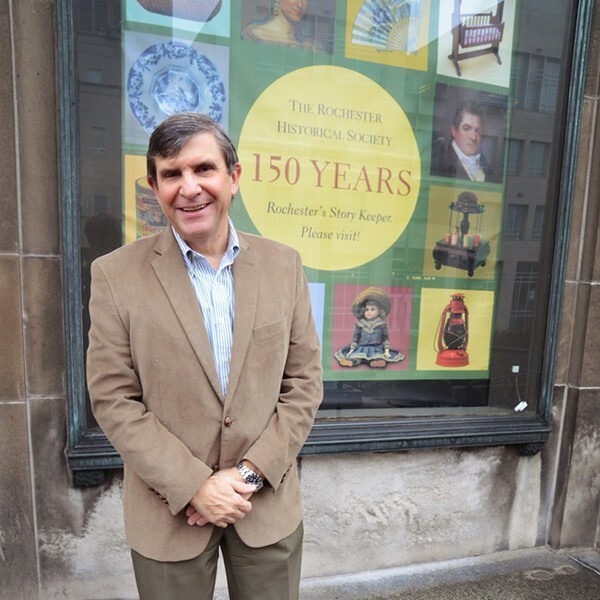 The Rochester Historical Society continues to struggle financially, and is currently living rent-free at Rochester Public Library's Rundel building on South Avenue. But a plan is in place that will hopefully help, says society President Patrick Malgieri. It includes a commitment from board members to donate $100,000 to the society over three years. The society's annual rent is set at $48,000, but earlier this year, it informed library officials that it couldn't make the payments. The society hasn't made a rent payment since April, and Malgieri says there's no plan yet for the payments to resume. "We've told the library that we want very much to honor the obligations that we undertook when we signed the lease," he says. "And if the opportunity presents itself, then we very much want to do that. The library has been a good partner in working with us through this situation." RPL Director Patricia Uttaro says she expects some sort of resolution to the rent issue by January 2014. The society's lease at the library expires in June. The society's collection includes important pieces from Rochester's history, including photographs, portraits of Rochester residents, letters, and architectural drawings. The bulk of the collection is kept at Rundel. Malgieri says that the collection is in no danger as a result of the society's financial pressures because deaccessioning is a comprehensive process that requires multiple approvals. It must also meet established criteria, he says. And state law says you can't use funding acquired from deaccessioning for general operations, Malgieri says. In addition to the $100,000 commitment from board members, the society has asked its general membership to give more, he says, and it is reaching out to key people in the community for support. The society is also exploring partnerships with other Rochester institutions, Malgieri says, but the specifics aren't yet clear.